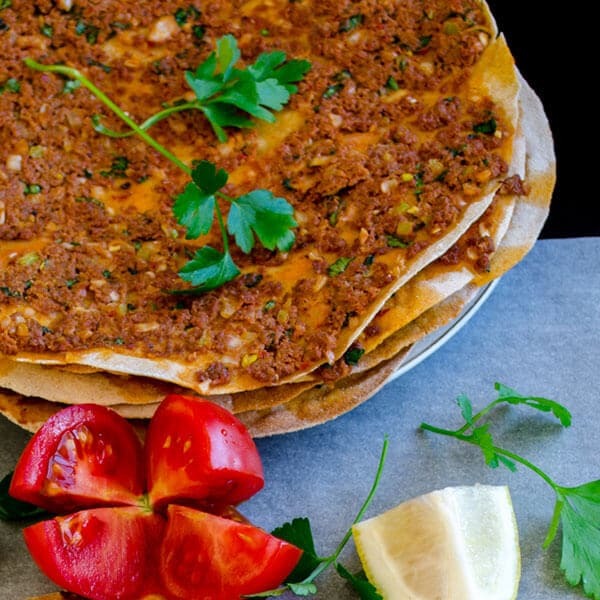 Lahmacun is one of the most favorite Turkish fast foods! Some say it’s like pizza, but it has a much thinner crust! You know I like making things at home, so I made lahmacun with whole wheat flour from scratch today! People generally prefer eating it at lahmacun or kebab restaurants and making it at home is not the first choice for everyone. I accept, it’s the easiest way, but what about making it according to your taste at home? It is made with white flour when you eat out, but I want to make a healthier version, so I made lahmacun with whole wheat flour. I’ve been using whole wheat flour for pastries, breads, even for cakes and cookies for some years now, and we see no difference in taste. 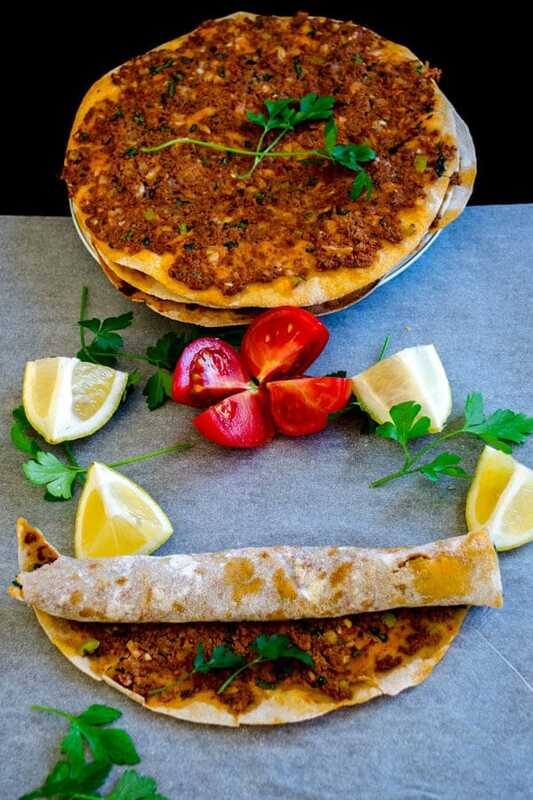 There are two types of lahmacun in Turkish cuisine. One of them is with very thin and crunchy crust and as big as a plate –even bigger than it, as you see above. This one is made all around the country with some little twists. The other one is a smaller version with a soft and thicker crust, which is made just in Mersin and Tarsus, southern part of Turkey. 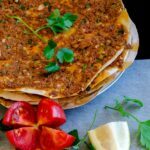 I shared the recipe of this small version of lahmacun,which we call findik lahmacun in the past. We always have mini lahmacun and pide whenever we visit my hometown, Tarsus. I think this version is more like a pizza, just smaller than it. Making lahmacun with whole wheat flour is not a typical way of making it in Turkish cuisine, but if it’s healthier with no difference in taste, why not try it? 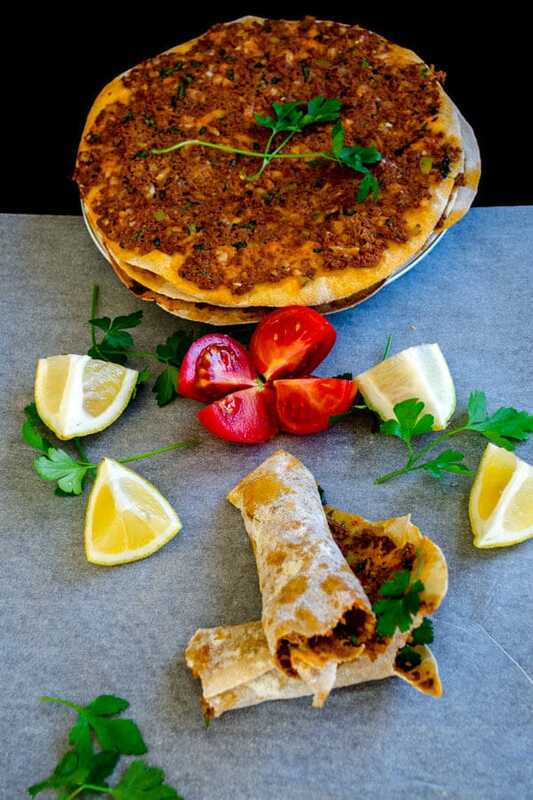 Lahmacun with whole wheat flour is definitely as tasty as the ones we eat out! It is said that the thinner the crust, the tastier it is, so I tried to roll it out very thin. I love breads and crusts darker, so whole wheat flour was a great choice here, it gave a nice color to our lahmacuns! I also sprinkle a little whole wheat flour on the baking paper to have the bottoms of lahmacuns with flour for a nice texture. 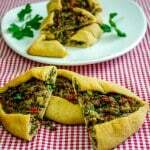 Lahmacuns are served mainly with parsley, lemon and tomatoes. Some restaurants might serve chopped raw onion, pickled chili or salad with lahmacuns. And ayran or salgam is served as a drink. People generally order two or three lahmacuns- if not more, so one is never enough. Some restaurants serve it sliced, but I like mine whole. So how do we eat lahmacuns? Put some parsley on one side of it, squeeze lemon on it and roll it up! Thant’s the way we love to eat! I put some of these lahmacuns in the freezer so that we can enjoy lahmacun with whole wheat flour in a busy day too! ½ cup extra whole wheat flour to use when Rolling it out. Mix dry yeast with sugar and lukewarm water in a glass. Wait it about 10 minutes. Sift whole wheat flour and make a well in the middle. Sprinkle salt around the well. Pour the yeast mixture into the well. Mix it with your hands. Add ¾ extra water into it little by little. And continue mixing with your hand. Knead it with hands for some minutes until you have a non-sticky, soft dough. You can add little extra water or flour if needed. Give it a ball shape. Cover it with a piece of clean cloth and wait for 40 minutes so that it has a double size. Meanwhile you can prepare the filling. Mix all ingredients until combined well. Dust the counter with a little flour. Make a log from the dough and cut it into equal 14 pieces. Roll them out very thinly. Place baking paper on your oven tray. Place the thinly rolled out dough on it. Put a generous amount of filling on it, spread it everywhere with a spoon or with your hand. Bring the heat to 240C and bake for 8 minutes. My oven has three trays, so I make 3 lahmacuns at a time. You can freeze baked lahmacuns for future eating. Hi, Zerrin, I’m Italian and I was in Istanbul last week. I loved turkish cooking and you can imagine my joy when I found your recipes, so clear and simple, although I have some difficulty with cup and tsp… I ate lahmacun in a small bakery with few tables in Balat and I loved it! I’ll try to do it myself very soon. Your Lahmacuns look amazing! A wonderful dish. I made this speciality once, but I’ll have to make it again soon as I’m starting to crave those scrumptious flatbreads. You must try it with whole wheat flour next time! You will love the color too! Hi Chris! Making these with tortillas is absolutely the easier way, but it’s better when you make the dough yourself. We nver have it with cheese, but sounds intriguing! I love to try new things on out traditional dishes, so I must try it next time. Lemon definitely completes the flavor, try it! Yes, it’s better than with the white flour, especially if one is not enough, hehe..
My favorite sunday brunch, but I usually eat it at the lebanese restaurant, and never tried it at home. I mean this version, the thin one. It’s mostly like what we call sfiha in arabic, but sfiha is thicker, it’s the same when you add raw meat to the dough. Thanks Zerrin for sharing the recipe. It is not that hard to make it at home Samah! I love to have a good amount of filling on my lahmacun, so I can put as much as I like when I make it at home:) I haven’t heard of shifa before, thanks for informing! This lahmacun is my kind of ‘pizza’.. thin crust.. looks delicious! Btw, Thanks for visiting my blog.. After weeks of traveling in February, now only I have time to catch up on blog visits..
We’ve never tried to make our own lahmacun before but we do love it and you’ve made it look quite easy! 🙂 Your photos are great. If they don’t tempt anyone to try lahmacun, nothing will!